Anthony Mackie and Jamie Dornan are teaming up for a new sci-fi thriller. Jeremy Renner teases a roughed up Hawkeye for Avengers 4. George R.R. Martin hints that those other Game of Thrones prequels might not be so dead. Plus, behind the scenes on Black Lightning. Spoilers go! Speaking with Fandango, director Ruben Fleischer confirmed Zombieland 2 will begin filming next January in Georgia. We’re already actually starting Zombieland. I’ve been scouting and storyboarding and getting it going, and to get to work with that cast again is just an absolute dream come true. It’s been really exciting starting to think about that movie, and to get to work with Emma, Jesse, Woody and Abigail once again is truly a dream come true. Yeah, we’re just at the very early stages, but we have an amazing script, and we’re going to start shooting in Georgia in January. In a recent interview with THR, Wicked creator Stephen Schwartz promised the film adaptation is forthcoming despite recently disappearing from Universal’s release schedule. I will tell you 100 percent there will be a movie of Wicked and it won’t be that far away but it won’t be next year because we’re still writing. Pre-production hasn’t even begun but that could start in the not-too-distant future. [December 2019] was always a fake date. There wasn’t a prayer in hell. Jeremy Renner shared a set photo of Hawkeye looking especially roughed up on Instagram. A space shuttle and drone appear alongside Michelle Williams in a new international poster from Coming Soon. 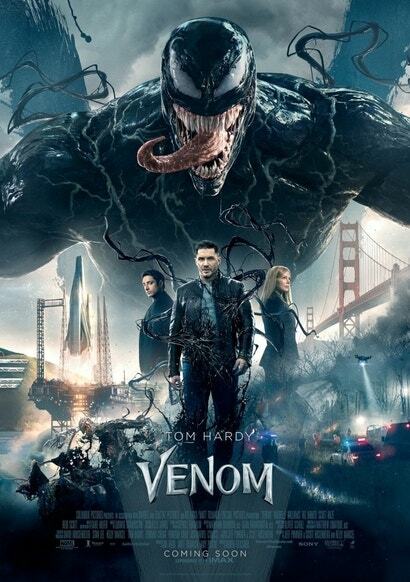 Oh, and Venom is there too I guess. Johnny English picks up a vintage Aston Martin in a new clip. We also have the trailer for Mermaid’s Song, a period set mermaid vs. gangsters movie starring Game of Thrones’ Iwan Rheon that hits digital/VOD today. We don’t get aliens in Sheffield. 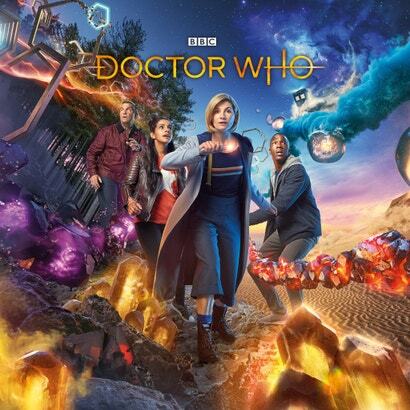 In a South Yorkshire city, Ryan Sinclair, Yasmin Khan and Graham O’Brien are about to have their lives changed forever, as a mysterious woman, unable to remember her own name, falls from the night sky. Can they believe a word she says? And can she help solve the strange events taking place across the city? Still reeling from their first encounter, can the Doctor and her new friends stay alive long enough, in a hostile alien environment , to solve the mystery of Desolation? And just who are Angstrom and Epzo? 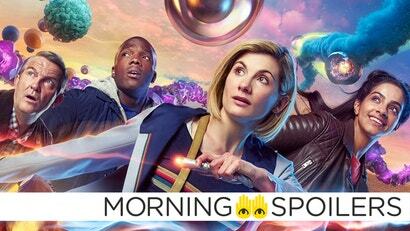 The BBC has also released a new poster full of gems and hexagons. During a red carpet interview at last night’s Emmy Awards, George R.R. Martin stated he “doesn’t know” why Game of Thrones is ending, “but that’s fine, we have five prequels in development,” seemingly contrary to recent reports that most of those prequels are not going ahead. After the Legends defeated Mallus and wiped the final anachronism from time, they find themselves in unfamiliar territory with the Time Bureau. All that changes when Constantine (Matt Ryan) informs Sara (Caity Lotz) of a new magical threat that leads the team to Woodstock. Constantine thinks he knows how to defeat the new threat, but will need the help of the team and their special klepto talents to help with his spell. Meanwhile, Nate (Nick Zano) and Rory (Dominic Purcell) go on an adventure leaving Nate facing someone from his past. Finally, the CW has released a “behind-the-scenes sizzle reel” for Black Lightning’s second season.